PM Modi paid tributes to Dr Babasaheb Ambedkar in Deekshabhoomi, Nagpur. Nagpur: Prime Minister Narendra Modi today paid tributes to Dr Babasaheb Ambedkar on his 126th birth anniversary at Deekshabhoomi in Nagpur. 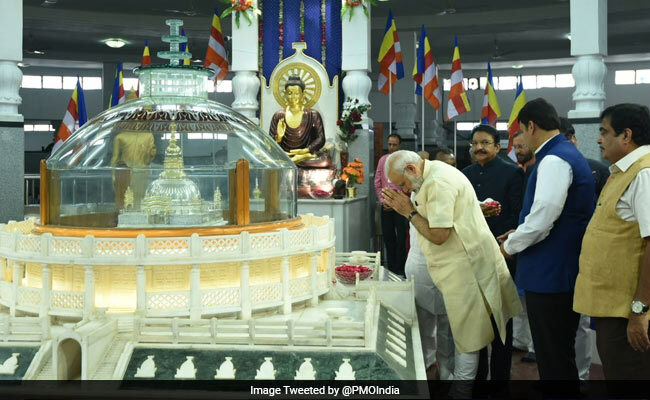 After paying floral tributes at the hallowed precincts, where the Dalit icon and architect of the Constitution embraced Buddhism in 1956 with his large number of followers, PM Modi prayed for a few minutes with folded hands. Ahead of his visit, PM Modi tweeted yesterday that he was "extremely honoured" to be visiting Nagpur, on the "very special occasion" of Ambedkar Jayanti. On a day-long visit to the second capital of Maharashtra, the PM is also to dedicate to the nation 14 units of thermal power plants at Koradi, Chandrapur and Parli with a total capacity of 3,230 MW. These include three super-critical units with 660 MW each at Koradi, two of 500 MW each at Chandrapur, and one of 250 MW at Parli. "A series of development projects are going to be inaugurated in Nagpur, which will have a positive impact on people's lives," PM Modi had said in another tweet yesterday. "We are unwavering in our efforts towards creating a strong, prosperous & inclusive India of Dr Ambedkar's dreams," PM Modi said. He will also address a public rally at Mankapur in Nagpur.